Sharks, even little guys like this black-tip, can cause plenty of injury. You say you want to go shark fishing from your boat? Me, too. But shark fishing most certainly opens up a whole new realm of dangers—even when you’re only catching little guys. Here are a few do’s and don’ts that will help you keep all of your fingers and toes attached. 1. 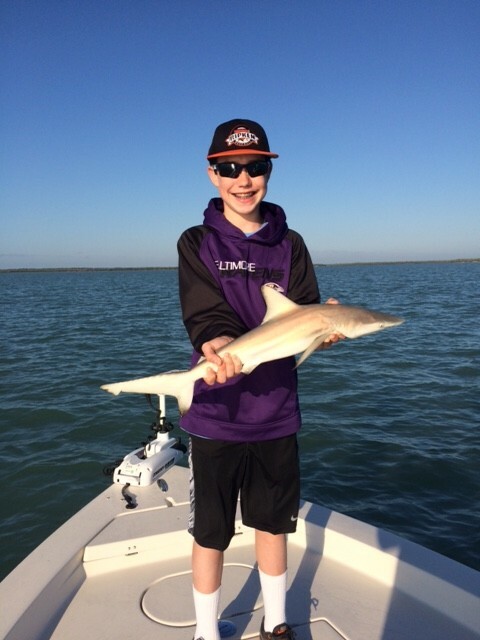 Always hold a shark with two hands, like young angler Gavin is doing it in this picture. Many people make the mistake of holding a small shark up by the tail. But these creatures have the ability to bend their body around 180 degrees, even when being held upside-down. Holding one up by the tail regularly leads to bites on the hand or wrist. 2. Don’t carry a gun to shoot large sharks. First off, more then one guy has tried to shoot a shark right when a wave hit the boat, and ended up shooting the boat. Secondly, this doesn’t always kill them. Finding that pea-brain with a bullet is easier said than done and the shark may appear to have been dispatched, only to “come to life” after being dragged into the boat. A smarter move is to secure the shark with a tail-rope and a gaff, them shove a five-gallon bucket over its snout. Tie a rope to the handle of the bucket, tension it, cleat it off, and you’re assured those teeth will be kept out of action. 3. Don’t try to remove a hook from the shark’s jaws without long-nose pliers. Yes, this sounds like common sense, but people still try it all the time. With large sharks, don’t try it even if you do have pliers. Simply cut off the rig—and keep your precious fingers far from those snapping jaws. BONUS TIP: If you catch an exceptionally large shark on a small boat and you plan to keep it (there are only a few edible species, like makos, threshers, and Sharp-nose sharks) don’t even think about bringing it into the boat. Instead, get a tail-rope around it, and drag it backwards, behind the boat. Yes, it will take a long time to get home. But that’s a penalty well worth paying. Is shark fishing REALLY that dangerous? You may not think so. I, however most certainly do. I’ve seen sharks bite through the side of an Igloo cooler (no challenge whatsoever, from the shark’s perspective); chew through fuel lines (spurting gas was everywhere); and put a series of serious puncture wounds into an arm. Have fun out there but keep it safe, with these shark fishing do’s and don’ts.